In what will most likely come as welcome news to many female Nigerians out there, this young Brazilian girl is set to shave her head and sell it. 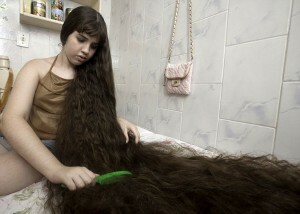 According to The Sun, 12 year old Natasha de Andrade is said to be parting with her locks for a sum of almost N1 million. The hair is to be used in the manufacture of wigs and extensions. On behalf of millions of our Nigerian sisters, we say thank you Brazilian girl. You are an inspiration for this kindness you have shown us.